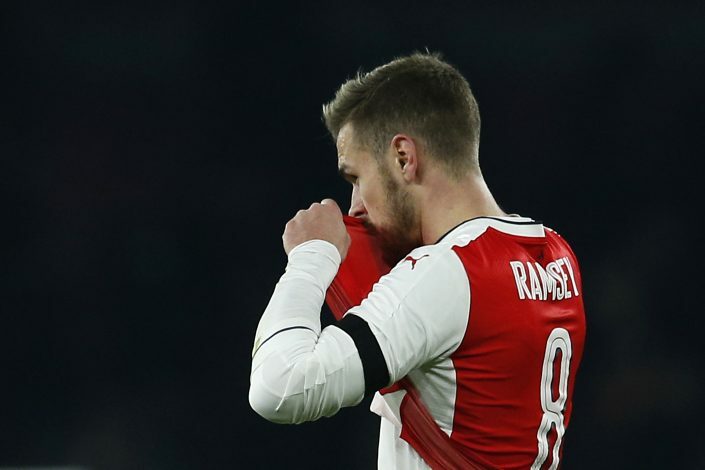 Aaron Ramsey is set to become a free agent at the end of this season, and a move to the Bundesliga could be on the cards. Arsenal have made multiple attempts to tie down the Welsh International with a new contract. But Ramsey is adamant on running down his current deal, as he looks to join a club with a strong prospect in the Champions League. According to a report in Goal, Bayern Munich are closing in on the midfielder, and a contract could be signed in January. The Bundesliga giants are yet to make any comments on their interest, but consider themselves in pole position at the moment. The Bavarians are having a difficult time this season. There seems to be a lack of quality in their midfield, which is a huge threat to their title defence. Bayern officials are wary of the issues, and will be looking to fix them before the start of next season. James Rodriguez hasn’t been in great form lately, and could return to Real Madrid in the summer, thereby allowing Bayern to acquire Ramsey and freshen things up in midfield before the start of next season. The reigning German champions are set to open contract discussions on January 1, as Ramsey is free to negotiate with possible suitors and sign a pre-contract with clubs outside England. The report further suggests that there are six clubs who are interested in signing the Wales International. Barcelona, Juventus, Inter, Manchester United, and Chelsea are also keen to land his services, and could put forward an offer in January. Last month, Ramsey confirmed that Arsenal had offered him a new contract, and was ready to sign it, but the Gunners surprisingly pulled it back without giving a proper reason. “There is no contract on the table at the moment so there is nothing for me to consider,” said the midfielder. “We all know that the contract was taken away off the table.